A draft example of a script which places a Due report (Markdown with some HTML color tags) in the clipboard, so that you can view/print it from a Marked 2 clipboard preview. (This report groups items by due date. They are sorted, within day headings, by any time component of the @due(dateTime) tag in that item. 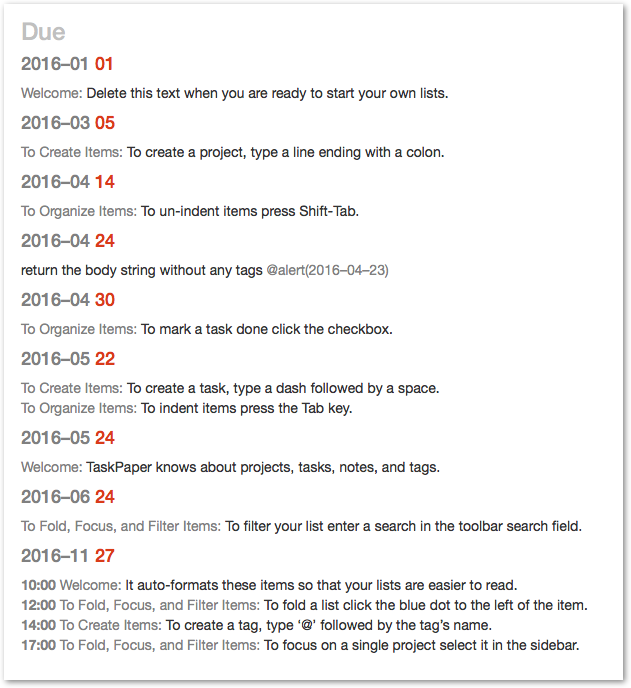 Tags other than @due are displayed in the text, which is preceded by the project title, as well as any specific time). 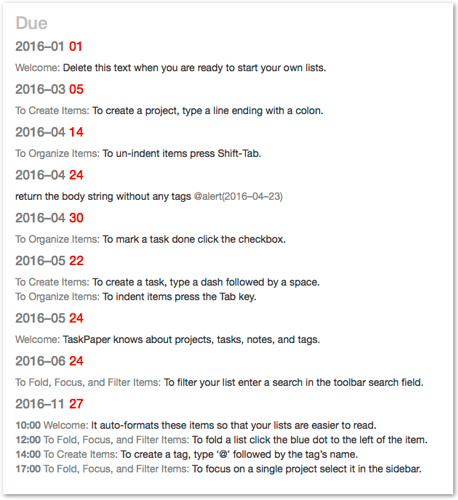 I just started using TaskPaper (I have experience with FoldingText and running scripts for TP). Do you have any idea what could be going wrong? Well caught – there has been a slight shift in the API between that Preview example and the release version. I’ve made a couple of edits. It’s still just an illustrative draft, but I think you may find that it is now compatible with the release version of TaskPaper 3. Thank you; the error message is gone now. I am not (yet) using Marked 2, or another Markdown editor/viewer. I used a simple editor to check the clipboard’s contents and recognized some of the actions with due dates, so it seems to be working. As an alternative to using Marked 2, would it be possible to have the (adapted) script’s output appear in a new TaskPaper file (instead of in the clipboard)? It’s certainly possible to generate grouped reports like this in any text format. I’m not sure how one would best handle the date headings and time prefix in a specifically TaskPaper format. Do you have an example of what the output that you envisage might look like ? Yes I have an example, see the link below, referring to a similar solution for FoldingText (thanks to your help). Thanks a lot. This goes in the right direction! I have no experience in writing scripts, but I guess I can fine-tune the way that the output appears e.g. by looking into the details of the script, and also by comparing the FoldingText script and this one. Will look into it later.